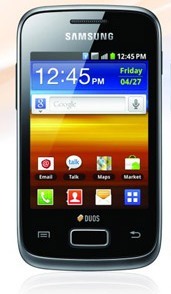 Today Samsung India has launched dual-SIM smartphone Samsung Galaxy Ace Duos in the Indian Market. This phone will soon be available in the Indian market. Samsung Galaxy Ace Duos has the 3.5 inch HVGA display, 832 MHz processor and runs on Android 2.3 Gingerbread OS. This phones comes with dual-SIM Dual active technology that allows users to be available on both GSM and CDMA at the same time.